Computers & Fluids is multidisciplinary. The term 'fluid' is interpreted in the broadest sense. Hydro- and aerodynamics, high-speed and physical gas dynamics, turbulence and flow stability, multiphase flow, rheology, tribology and fluid-structure interaction are all of interest, provided that computer technique plays a significant role in the associated studies or design methodology. Applications will be found in most branches of engineering and science: mechanical, civil, chemical, aeronautical, medical, geophysical, nuclear and oceanographic. These will involve problems of air, sea and land vehicle motion and flow physics, energy conversion and power, chemical reactors and transport processes, ocean and atmospheric effects and pollution, biomedicine, noise and acoustics, and magnetohydrodynamics amongst others. 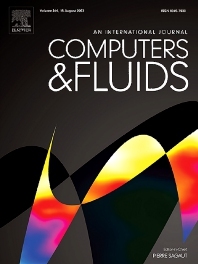 The development of numerical methods relevant to fluid flow computations, computational analysis of flow physics and fluid interactions and novel applications to flow systems and to design are pertinent to Computers & Fluids. Benchmark solutions are also within the scope of the journal and will be published in dedicated issues. Statement of the physical model and flow configuration: both the governing equations, boundary conditions and geometry and governing dimensionless numbers (Reynolds number, Mach number...) should be clearly explicated in such a way that readers may reproduce the results. Statement of numerical methods: they should be described in a clear way, including boundary conditions and initial conditions. Formal order of accuracy should be given. Methods should be at least second-order accurate in space for spatially smooth solutions, locally first-order accurate methods being appropriate for flows with discontinuities (e.g. shocks). Statement of code verification activities: numerical implementation of the numerical schemes and algorithms should have been verified, e.g. using analytical solutions, manufactured solutions or highly accurate benchmark solutions. Spatial, temporal and iterative convergence of the presented results should be asessed in the manuscript. Grid convergence must be proved considering several computational convergence with respect to the number of degrees of freedom should be assessed. Iterative convergence should be proved for steady-state results plotting residual evolution. Temporal convergence should be proved considering several values of the time step. Article must be submitted by authors from at least two different institutions. The flow configuration should be exhaustively detailed and parameterized by usual dimensionless parameters (Reynolds number, Mach number, angle of attack...). The paper should present results associated to a parametric exploration of at least one configuration parameter (Reynolds, Mach...). The selected range(s) of variation should encompass at lest one bifurcation in flow topology or flow dynamics (e.g. appearance of flow separation, rise of additional characteristic frequencies...) and the associated critical value(s) of the governing parameter(s) must be carefully determined. It is emphasized that new proposed benchmark solutions should significantly increase the confidence into numerical methods capabilities. Therefore, simple variations about already existing text cases will not be accepted. At least three different numerical methods should be used and compared on all figures/tables. Simple comparisons of numerical options available in commercial CFD tools and widely used open source solvers will not be accepted. In the case some results already exist for some test cases presented in the manuscript, a related exhaustive reference list should be given and associated data used for comparision. The benchmark solutions should be free of any physical modelling uncertainty. Therefore, turbulence model or other semi-empirical physical models should not be used. Grid convergence should be assessed considering at least four resolution levels. For gridless and stohastic methods, four refinement levels in terms of number of degrees of freedom should be presented. The manuscript should provide the reader with tables and plots displaying values of relevant and useful physical quantities versus (i) grid resolution/number of degrees of freedom and (ii) flow parameters in the selected range of variation. Authors are also strongly encouraged to provide full data set in text format that will be made available as supplementary materials. Authors are free to propose benchmark solutions. In the case several submitted papers under review deal with the very close test cases, authors will be asked to converge on a set of test cases and to re-submit a common paper.